Somehow I was under the impression that I didn't get much things done in 2012. Probably because I only released two embroidery patterns (Abel the Stitch Explorer and Tales of the Forest Motifs ) and made some crafty resolutions and plans that didn't quite work out. I have been keeping myself busy though: a big new project was started (&Stitches e-zine and blog) and I contributed to a book (to be released next fall I think). I worked on improving my embroidery skills, trying out shading techniques and making more detailed embroidery work. Something I will continue to do in 2013. I think I only finished two quilts, 3 quilt tops, started about six new quilts and bought enough fabric to make another 12 quilts! 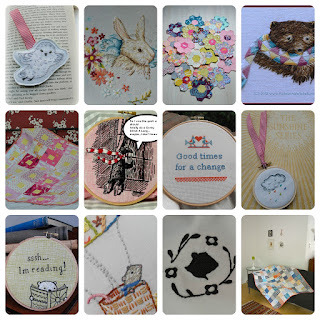 :) In August Pretty in Patchwork holidays was released to which I contributed three patterns. In June I attended the Fat Quarterly Retreat in London which initially was scary but turned out to be a fun experience. I learned how to do English Paper Piecing there and now have a box full of hexagon-flowers (but not nearly enough to make a quilt). I have already bought my ticket for next year's retreat and hope to meet some of you there. In 2013 some things will continue (this blog! ), some things will change and I'm sure exciting new things will be created too! I have enjoyed following your blog since meeting you this summer. You have even inspired me to start embroidering (helped by the FQR class with Aneela). Thank you! I love each of your projects, they look so good all together. Thank you! After I posted this I realized I forgot to include some other stuff I made! I am also looking forward to meeting you again at FQR in July. Your projects and patterns are wonderful and congrats on being published. Here's to a wonderful 2013! Thank you! Wishing you a very creative 2013 as well! All your work is always so beautiful and I wish you the most fantastic 2013! Cheers from Mexico, Alejandra. All of your projects are wonderful.Congrats!